We tip our cap, to the Cap, with Cap! 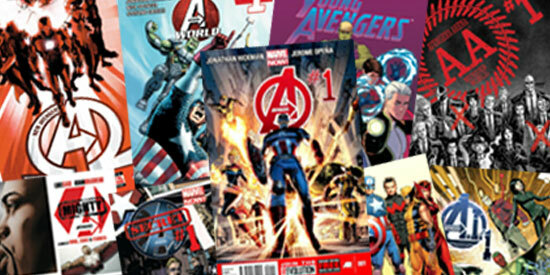 Hello sports and comic book fans, this is Michael from the back issue department for this installment on the national pastime and the First Avenger. With the Major League Baseball (MLB) postseason in full swing, the 2014 season is drawing to a close. For one player, his season and career has ended: New York Yankees shortstop Derek Jeter. Jeter, along with MLB, has said their goodbyes and thanks. 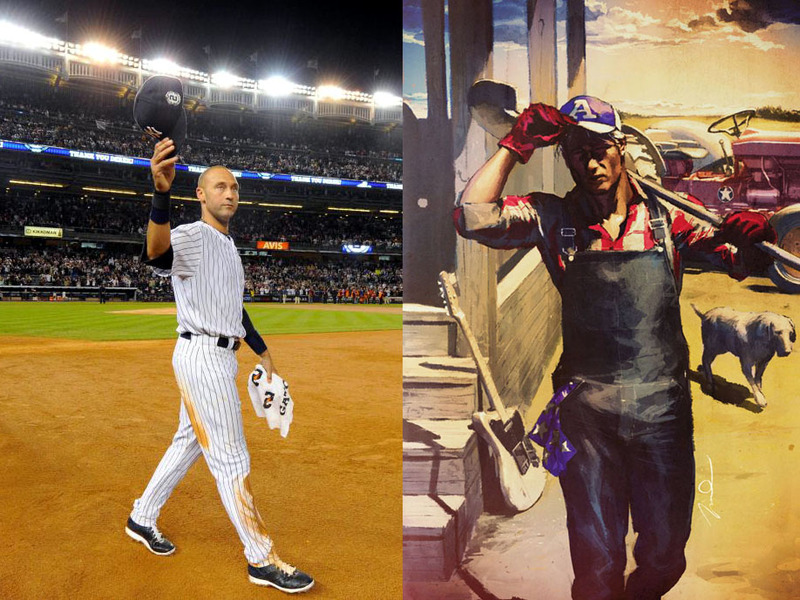 The thought came to mind to thank Jeter the comic book way. If the 11th Captain in NY Yankees history Derek Jeter were a comic book character, he would be Captain America, Steven Rogers. New York Comic Con Cosplay Bingo! We hope everyone’s gearing up for this year’s New York Comic Con 2014! We have a number of fun exclusives, discounts, giveaways, and contests this year, with yet another way to win prizes in our first ever NYCC Cosplay Bingo! With help from Comics and Cosplay, we present our new NYCC Cosplay Scavenger Hunt/Bingo contest! Learn how to enter below! 1. You have to follow both Midtown Comics (@MidtownComics) and Comics and Cosplay (@ComixNCosplay) on Twitter. 2. You have to take a picture with each cosplayer you find at the convention. 3. Tweet the picture to both @MidtownComics and @ComicxNCosplay . 4. Include the hashtag #CosBingo so we know its a contest entry. 5. We will announce the winners on twitter! Marvel Studios has certainly accomplished many feats that had been called impossible (or at least highly unlikely) in the short time since they started building the Marvel Cinematic Universe. It has only been a few years but people seem to have already forgotten what a huge achievement bringing several characters from separate movies together for a team up was. The mere fact that Thor and Iron Man are now household names is incredible to me. However, when it comes to Guardians of the Galaxy this is without a doubt their riskiest step yet, because although Iron Man may not have been a common name when his film was made, nobody outside of the comic book community has ever heard of Guardians of the Galaxy and it is so different from every film they’ve made so far that the average movie goer has no idea it’s even a Marvel film. Well, after seeing the movie I am happy to say that this was a gamble that paid off, big time. Unfortunately, There is no such thing as Superman or Spider-Man in our real world. There is no one we can look up into the sky and see protecting us from the real evil that surrounds us. While superpowers are useful, there are still superheroes who are just like us, making it their duty to protect and serve without any Spider-Sense, X-RayVision, or Adamantium Claws. Living in a world of superheroes without any powers may be tough, but here are my Top Eight Heroes who can still get the job done! Well don’t worry, I’m here to help as I’ve written a breakdown of what each of the “Avengers” titles are currently about, what audience they are aimed at, and of course, answering whether or not it actually is about the Avengers. We’re limiting these to active superheroes: the dead and the villainous need not apply (Sorry Professor X, Sentry, Molecule Man and Ares…) Anyone deceased as of Jan. 30th,2013 is disqualified. We’re also limiting this to a certain degree of power: let’s leave Galactus and co. out of this one. This is a knock-down, drag-out fight to the death. No one is holding back. For the sake of sanity I’m limiting this list to Marvel, doing Marvel vs. DC just makes my head explode.